HISTORY: Woodwind instrument of the clarinet family that plays in the alto range. SOUND PROPERTIES: The alto clarinet has a dark sound with a reedy quality. It is not as dark as the lower pitched clarinets, but has a much heavier sound than the higher pitched clarinets in A flat, B flat and E flat (soprano ). There are three distinct registers on the alto clarinet, with the chalumeau being the lowest and clarino being the highest. 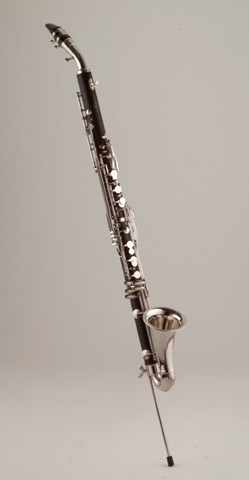 The alto clarinet has a strong sound in the lower end of the chalumeau register and in the clarino register. It is most often used in concert bands and clarinet choirs and is scored as the tenor voice in these ensembles. RANGE: The chart below shows the range of the alto clarinet. It is a transposing instrument in the key of E flat, and sounds a major 6th lower than the written pitch. Thus, the lowest written note (E flat), when performed, actually produces the pitch G. Another way to think of it is that performing a written C on the instrument will produce the pitch of E flat.